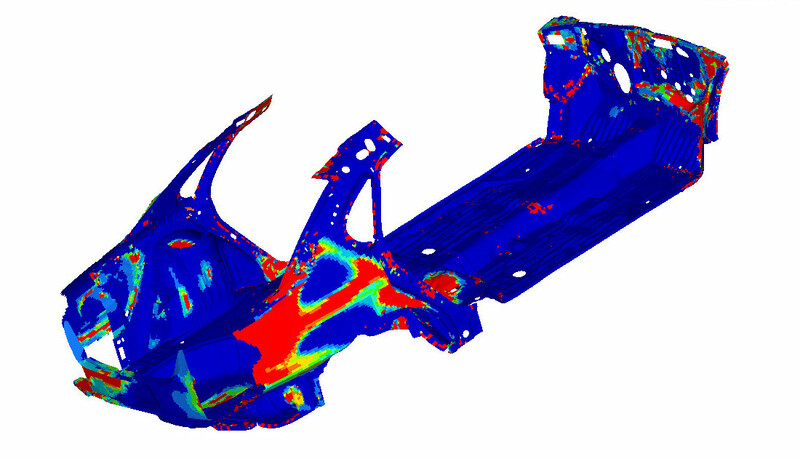 TROY, Michigan, March 20, 2019 – Altair (Nasdaq:ALTR), a global technology company providing solutions in product development, high-performance computing and data intelligence, announced today that it has achieved up to 10x speedups with the Altair OptiStruct™ structural analysis solver on NVIDIA GPU-accelerated system architecture — with no compromise in accuracy. This speed boost has the potential to significantly impact industries including automotive, aerospace, industrial equipment, and electronics that frequently need to run large, high-fidelity simulations. The test suite included a variety of industry models including multiple solution types such as statics, frequency response, buckling, and optimization. Support for GPU acceleration began with OptiStruct’s direct solver and with the large-scale NVH solver AMSES, a standard feature of OptiStruct. AMSES drastically cuts the time required to compute eigenvalues for analysis in NVH simulations, and it can rapidly calculate thousands of modes with millions of degrees of freedom. The same impressive levels of acceleration were achieved with both solvers. Most recently, the OptiStruct development team extended GPU support by porting OptiStruct’s PCG iterative solver on the same NVIDIA GPU-accelerated system, which resulted in some of the highest performance boosts seen. For some models — such as compact, block-like, solid structures — the PCG solver can be faster than the direct solver, especially when GPUs are in play. The upcoming OptiStruct 2019 release will include support for multiple GPUs. OptiStruct speedup on GPU-accelerated systems enables scaling for large models, particularly NVH models, that may run poorly or not run at all on CPU-based systems. The greater memory capacity of GPUs, including the ability to use multiple GPUs, means they can handle much larger, more complex models. NVIDIA® Quadro® GV100 GPU technology was used for the solver runs and was compared with dual Intel® Xeon® Sandy Bridge-EP 3.1GHz 16-core CPUs with 256GB of RAM. Run times compared were total elapsed times, or wall times, for the solution to complete. Altair OptiStruct is an industry-proven, modern structural analysis solver and is the market-leading solution for structural design and optimization. Based on finite-element and multi-body dynamics technology, and through advanced analysis and optimization algorithms, OptiStruct helps designers and engineers rapidly develop innovative, lightweight, and structurally efficient designs. For more information, please visit https://altairhyperworks.com/product/OptiStruct. OptiStruct speedup on GPU-accelerated systems enables scaling for large models, particularly NVH models, that may run poorly or not run at all on CPU-based systems. Altair is a global technology company that provides software and cloud solutions in the areas of product development, high-performance computing (HPC), and data intelligence. Altair enables organizations across broad industry segments to compete more effectively in a connected world while creating a more sustainable future. To learn more, please visit www.altair.com.